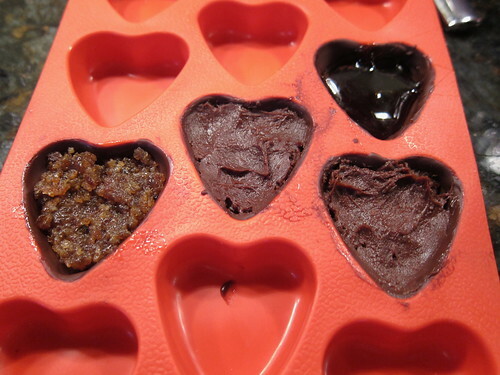 Recently, I picked up some heart-shaped silicone ice cube trays from IKEA and Target which inspired me to try my hand at making filled chocolates. I did a bit of research online and it didn't look like too tricky a process. Basically, just use a brush to coat the molds with chocolate, let set, fill and top with more chocolate. I learned a few tricks along way, like freezing your molds makes it easer to coat them with chocolate. For a complete step by step on assembling the chocolates visit my craft blog, Just Crafty Enough. 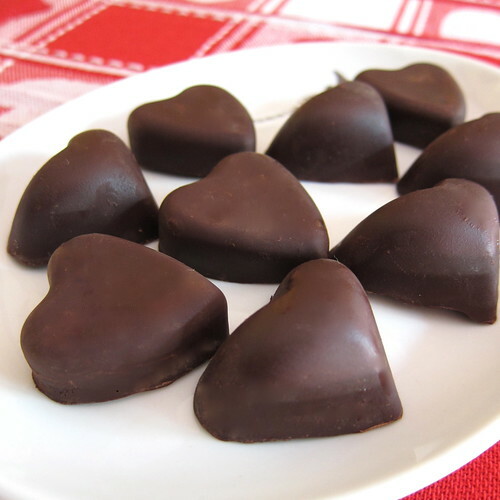 The main reason I wanted to try making my own filled chocolates was so I could fill them with whatever I wanted. I was thinking bacon and Matt suggested bacon jam. 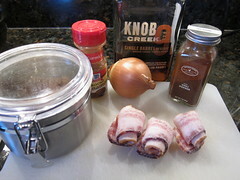 Then I though bacon jam made with bourbon and drunken pig chocolates were born. The salty, meaty jam with just a touch of heat works perfectly inside the sweet chocolate. 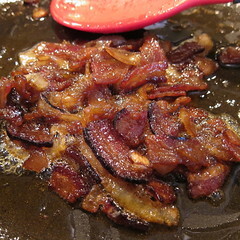 In a small skillet cook the bacon over medium-high until it renders its fat and it just cooked but not crisp. Remove to paper towel cover plate to drain. Leave about 1/2 tablespoon of bacon fat in the pan. Add the onion and cook until it becomes translucent but not brown. Turn the heat to low. Stir in the cinnamon and cayenne. Add the brown sugar and bourbon. Let cook on low until everything is sticky and brown. You want your onions to look caramelized. 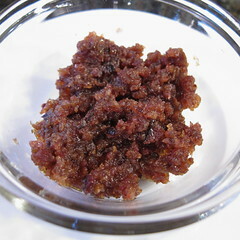 Put into a small food processor and purse until you get a chunky paste. Let cool before using to fill chocolates. 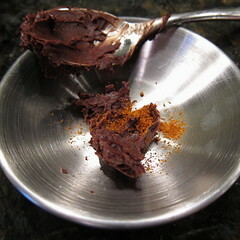 For the rest of my fillings I started with a basic chocolate ganache recipe from Joy of Cooking. I brought 3/4 cup heavy cream to a boil. Removed it from the heat and then stirred in 4 ounces of chopped bittersweet chocolate. My pan must have been too hot because my ganache broke and became an oily mess, luckily that is an easy fix. 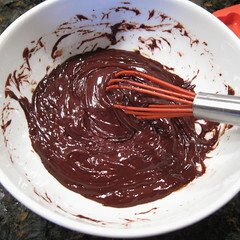 I whisked in a little more cold cream, about 1 tablespoon at a time, until the ganache came back together and became the smooth, shiny filling I wanted. Let the ganache cool to room temp before using it as a filling. You can put it in the fridge to help speed that process. Once you have the finished ganache, you can flavor it with anything you have on hand. I made three different flavors, cayenne, salt and cherry bitters. Just mix the flavoring with the ganache and taste until you get the flavor you like. I have to say I was really surprised at how good the cherry bitters were, it tasted like a chocolate covered cherry. Other thoughts I had for flavorings were lavender and St. Germain. The ganache filling worked really well in the chocolate because it set up stiff enough to help make the chocolates easy to press from the molds. 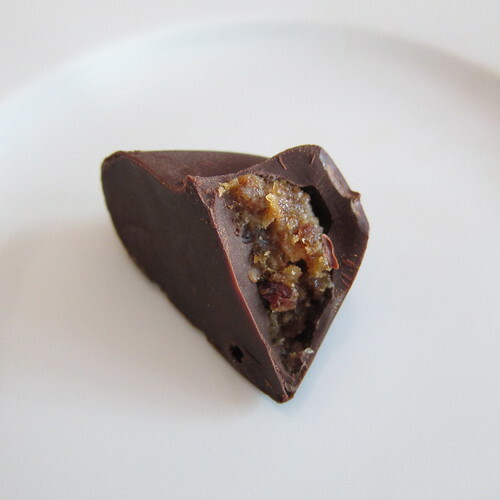 I also tried using caramel made from our Apple Cider Syrup as a filling, but it wasn't very successful. I had to heat it a bit to make it soft enough to get in the molds. Problem is then in was warm enough to melt the chocolate. When I tried to press it out of the mold it just fell apart. Maybe it I let it set up longer it would have worked out. Nothing better for Valentines than spiked up chocolates. Yum! holy cow (or pig, as the case may be), kat! these are up there among the best chocolates ever! Oh my gawd. I hope I have enough bacon to make this, because it has to happen NOW. Oh wow, these sound so freaking good!